For avid readers who happen to be night owls (and that’s most of us! ), a book light is more than a gadget — it’s like a friend that keeps you company on your bookly adventures late at night. And best of all, book lights let us indulge in the written word without disturbing our partners. For you musicians out there, a quality book light offers quiet support during hours of practice. It shines on sheet music and keyboards, keeping the light — and your focus — where it’s needed. And, to the crafter or hobbyist, book lights make a trusty sidekick offering a sharper view of stitches or brushstrokes or jewelry making. Take our advice: choose your book light as carefully as you would choose your partner. You’ve got lots of choices out there, but don’t worry — we’ve narrowed it down to the best of the best. Below, some of the highest-rated book lights. Happy reading! Since it appeared on the market, the Raniaco has graced the homes of book lovers everywhere. 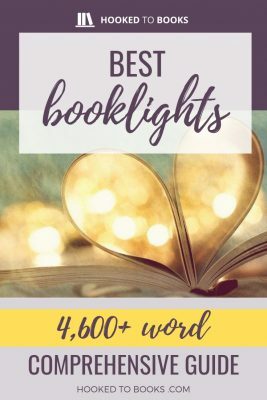 It’s the first item we think of when someone asks for our recommendation for a bright book light for reading, sewing, crafting, or even working at the desk. At first glance, the light looks fashionable in a sleek ABS shell. It’s pretty compact; however, compared to a typical book light, it is twice as big, and twice as heavy. On the other hand, the light is also 3 or 4 times more powerful. The reason is, the Raniaco comes with 12 LED bulbs on its head. As a result, it stands out as the brightest book light on the market. 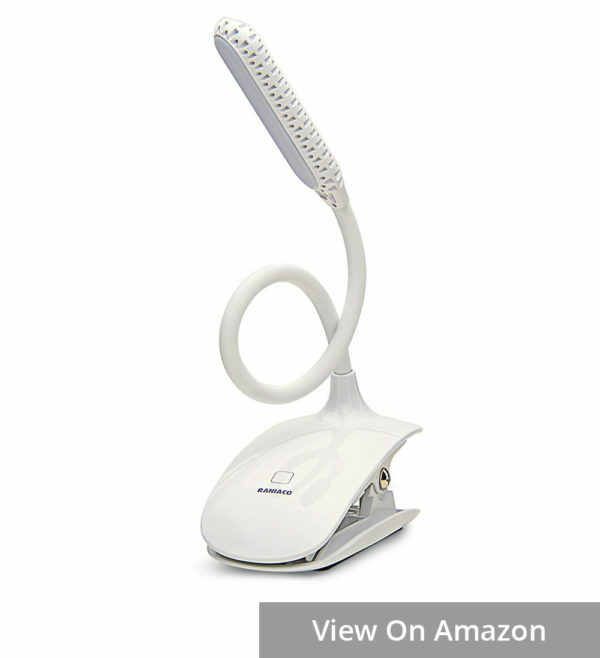 The cool white light helps increase your alertness and concentration ability, making it an ideal alternative light source for detailed tasks when a serious task lamp is not available. You can adjust the brightness through 3 levels: soft, bright, and strong, via a touch sensor on the base. With a powerful rechargeable lithium battery, the lamp can last up to 24 hours at the lowest level. At this mode, however, it can still be quite bright. Therefore, if you want a soft warm light to read at night, you may want to get a bedtime book light. The neck of this light is worthy of praise itself. It’s flexible enough to bend into to an O, but is at the same time very strong and stable. If you’ve used a book light with a loose shaky neck, you will understand how significant the difference this little detail can make. The biggest part of the Raniaco is the base. With an offbeat design, it looks like and is about as large as a Macbook mouse. Except it’s a clip that can open to 1.5 inch and take a hold firm of your big hardcover, table, or even bed headboard. The base can also stay independently on a flat surface to support the whole item to work like a desk lamp. The secret? There’s a super anti-slip silicone pad underneath it. When choosing a book light for reading in bed, the warmth level of the light illuminated is one of the most important criteria you should care about. You’ll want to make sure the light is pleasant to the eye, and doesn’t mess with your sleep hormones. With its warm light illuminated at 3000K, this Ecologic Mart’s item wins our vote for the best bedtime reading book light. The Ecologic Mart Eye Care book light consists of 2 branches that can work independently, or simultaneously when you have a big book or an intimate reading partner. Try various lighting options – there are 8 in total, with the intensity ranging from 5Lm to 40Lm – and both of you can now read in your desired shade of amber. Be it your time with a romance fiction, your parents’ mini chess game or your child’s comic adventure, this light promises to make it a moment of coziness. Despite having 2 light heads, it takes only one and a half hour for this beast to fulfill its rechargeable 1000mAh batteries via a USB cord. Depending on how you use this book light, one charge can last from a few days to several weeks. You won’t have to worry about it dying out of a sudden though – there are indicators to show you the charging and battery status. Another impressive feature of this product is that its charger head comes with two ports; so you can simultaneously use and charge the light and/or even your phone as well using the same block. One thing to note, however, is that the item can be slightly heavy if you want to clamp it onto the book or ereader and hold in your hands for a long time. Our nomination for the best Clip light for travel is made based on the criteria of portability, battery durability, and charging flexibility. The Mighty Bright 47012 doesn’t miss a single of all the listed requirements. This Mighty Bright item is very compact. The manufacturer seems to consciously make the design of this light as simple and space-efficient as possible. At 0.3 ounce and dimensions of 1.2 x 3 x 5 inches, you can put it anywhere in your laptop bag, backpack, or suitcase, and won’t even notice it’s there. The light’s flexi neck and its 2 brightness levels ensure focused, even illumination on your page when the surrounding lighting condition changes as you’re on the go. It uses power from a built-in rechargeable battery that can last from several days to weeks after a single one-hour charge. Never lug around those extra AAAs anymore! Just plug in a standard USB cord whenever the light indicator turns red. The clip of this light also nails it. It is firm enough to secure its hold on a book, but thin and small enough to not create any lump when you turn pages. As it is humble in size, however, the clip won’t clamp onto thick objects like your table side. Not that it’s made for that purpose, but it could be a minus point for some people. If you ever tried reading with a book light on a paperback, you’ve most likely been annoyed having to adjust, or re-clamp the iten every now and then as it moves and threatens to fall off when the pages bend. The Mighty Bright TravelFlex 42610 is made to solve the problem. At 0.3 ounce (8.5g) and very reasonable size, the Mighty Bright TravelFlex is extremely portable (hence the name “TravelFlex”). But that’s not the main reason it’s become the editor’s choice for the best reading light on paperbacks. The device has a long clip, which is composed of a thicker bar where the battery is, and a movable metal piece. The bar is long and heavy just enough to support the item to stay sturdy on the book, and prevent the soft, thin book from folding or bending. The movable part, meanwhile, is small and very thin. This allows it to stay inside the book without creating an obtrusive lump, causing difficulties when turning pages, which usually happens when you clip a normal light on a small and thick book. The TravelFlex has an LED that produces bright, but soft and even light, thanks to its thoroughly designed optical grade lens. While the number of LEDs is limited, the light comes with a long and very flexible neck that brings the head to wherever you want it on a large book. You turned your booklight on to read this fiction for only half an hour before going to bed, then when your eyes drifted off for once from the pages, it’s already 3AM. Sounds familiar? Mighty Bright has made this timer book light for us absorbed readers, hallelujah! Like its peers, the light has a constant-on mode for hours-long reads.There are such loooong interesting novels you just can’t leave, and it won’t judge you on that. But the cool thing is, it also comes with an adjustable timer. You can set the light to turn off after 15 or 30 minutes when it’s getting really late and you’re sleepy, but still determined to finish that ten-pages daily quota. When you want to enjoy a read to lure yourself to a peaceful sleep, set it to 45 or 60 minutes. Never wake up in the middle of the night just because you have to turn off a light anymore! To avoid the natural anxiety that associates with timers, the light has indicators that show you how much time is left. No worries about it turning off out of the blue moon either – it will flash once when there’s only one minute. This Mighty Bright cutie runs on 2 standard AAA batteries, which are included when you purchase the product. With only one LED, it can last 72 hours straight – that’s more than 2 months if you use it an hour daily! Thanks to its durable battery life, this would make an ideal booklight for travel too. In fact, it’s fairly lightweight (4.2 oz or 119 g) and comes with a flexible neck. Bend it, put it into your suitcase, and clip it onto your book whenever you’re in a mood for a good read. Not every ereader on the market comes with built-in LEDs. That’s when a separate reading light becomes a must-have item for ebook fans. If you’re a passionate book lover who spends several hours reading every week, consider an advanced ereader with better lighting. But if you love your current unlit device, this MoKo would be a more financially effective option. From the look of it, the MoKo is designed exactly for ereaders. Its clip has two part: the upper is small and compact so it won’t cover or make a shadow on the screen. 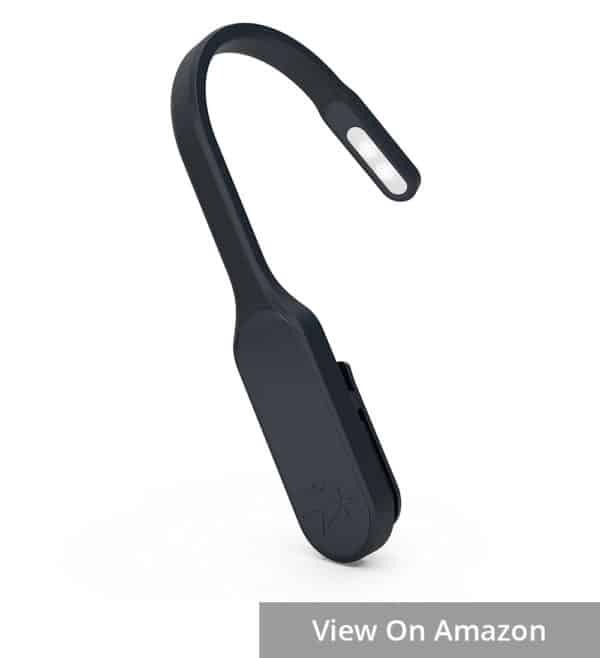 The lower part of the clip is wide and long, covered in a protective layer so it can grip to and support your ereader without scratching the device. On the light head are 3 LEDs, which produces a warm, pleasant light. You can adjust the light with 2 levels of intensity to get the desired brightness for your reading activity. As its name suggests, the light has a very flexible neck, which is also fairly long given its size. The adjustable neck allows you to point the head to your desired area on the device. You can also fold easily and put into your pocket. It’s the perfect light that you can bring along anywhere for reading on an ereader or tablet. The only minus point for this Moko is that it works using 3 AAA batteries, which are not rechargeable. However, as the light uses energy-efficient LEDs, it will take quite a while before you have to change the batteries. A light for the music stand must have strong enough a clip to clamp firmly to the stand, and should be broad and bright enough to shine evenly across the pages of a wide open score. In these respects, the Lumiens L9 is an excellent candidate. The Lumiens L9 comes with 9 LEDs aligned in a row on its head (hence the name). This allows its light to be evenly distributed on both pages (or 3 pages even) of a music book or the piano keyboard. Around its head is a ridge, which prevents excess spill even when the illumination is on the higher intensity. Thanks to that, you can rest assured that the light won’t annoy other band members and the audience with a relentless glare. 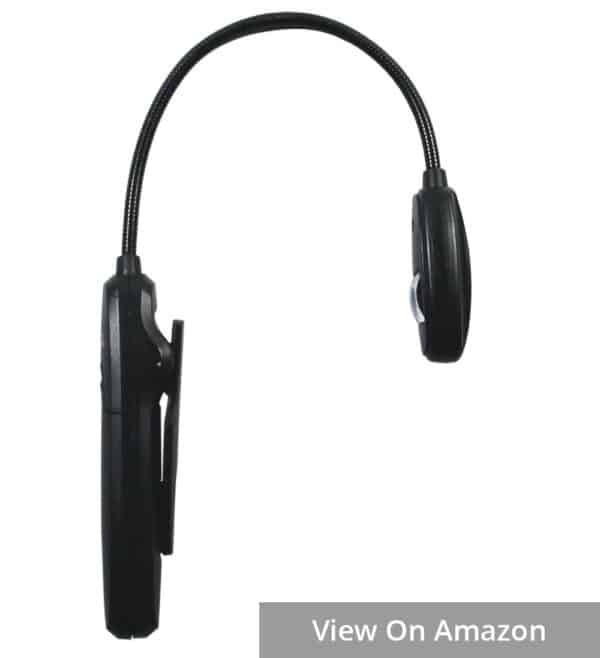 This gadget has a great clip, which can open up to 1.75 inches – wider than most normal clip reading lights. Its strong grip promises not to loosen a bit when you adjust the extraordinarily long (10 inches or 25.4 cm) flexi gooseneck. Inside it, there is a silicone pad to enhance stickiness and protect the gripped surface against scratches. Included in the package is a 78 inches (2m) power cord, which means you don’t have to always stand near a power socket while using it. The cool thing is, it can also run off the AC current with rechargeable 3 AA batteries, which can last 20 hours of continuous use. What you may also love: the manufacturer offers a lifetime warranty policy for it. With the brilliant idea to bring flexibility in both light color and brightness, the Thuctek easily wins our vote as the best new LED book light. On your hand, the light is as small and compact as any other of its kind. 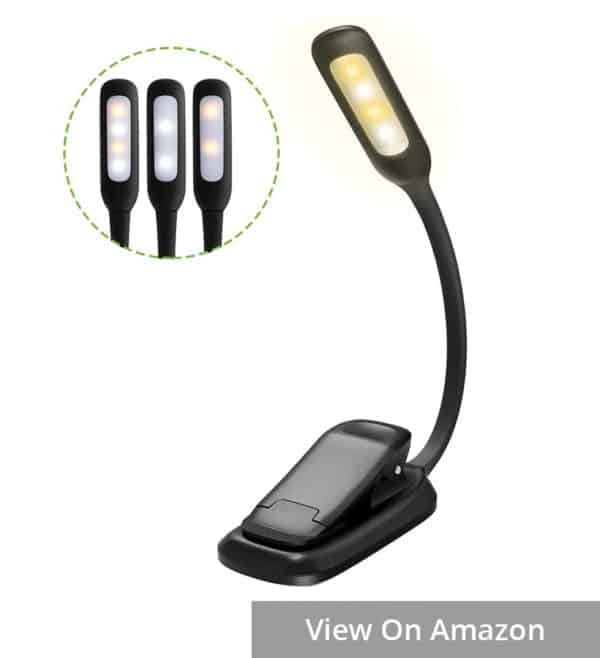 It has 4 LEDs distributed along a narrow light head, which is connected to a sturdy clip-on base via a flexible neck. A simple minimalism-inspired design. What makes it stand out is that 2 of the bulbs are blueish white, while the other 2 have a yellowish white shade. So the light comes with 3 intensity and color modes. As you switch the on/off button, it will change from from full brightness, warm light, cool light, and off. Sounds like a hassle to turn the light off, but it’s not. In fact, the different modes can be very useful, especially if you’re sensitive to light color temperature. When you’re in the mood for a soft read before bedtime, the warm white mode ensures you won’t be kept awake by too much blue light. If yellowish light makes you feel drowsy, there are 2 other options you can pick. The flexibility makes it the perfect light for reading or other activities under various lighting circumstances during the day and at night. The light can be fully charged in 2 hours using a USB cord, with a green/red light to indicate when it’s full. With a powerful built in 1000mAh lithium battery, it can last up to 10 hours. Complaints: While we found no problem with the book light, there have been complaints about the neck being shaky as you move the book. When you want to read with a small light but don’t fancy adding more weight to your book, a hug light would be very useful for you. Unlike other book lights, the Cesunlight doesn’t clip onto your book. Instead, you can hang it around on the back of your neck, and have the lightheads pivoting from your shoulders. This leaves you with free hands and very versatile positions for reading, knitting, walking, or other activities. With steel alloy arms, the item feels much more solid and sturdy than its weight (3 oz). They’re firm but flexible, allowing you to direct the light to wherever you want it. To protect your neck, the arms are covered with silicone. This silicone hug feels very soft on the skin, and it saves you from the horrible cold feeling when the metal touches you too! On the two ends of the huglight are the lightheads, each having its own on/off button. This is where you control the brightness mode: floodlight, spotlight, or both. If you are reading in bed at night, the floodlight is perfect. It’s bright enough to shine on a small area of your book, but dim enough not to wake your bedmate up. The spotlight mode, meanwhile, is more suitable for knitting or repairing things while in the dark, while the full mode is best for outdoor activities, such as jogging or dog walking. The best thing about the huglight is that it uses rechargeable batteries. Charging it is simple too: you just need a USB cord to do the job, and it’s included in the package. A 3-hour-charge can last somewhere from 6 to to 10 hours depending on the brightness mode you choose. I never need it for that long – usually 2 hours a time at most. It’s used more often on travel, for a walk outside or as an emergency light than an long-hours task light. And it does its job more than well. Thinking of a petite USB light to shine on your laptop keyboard, or on your novel while you read under the blanket? Take a look at this i2 Gear cutie. 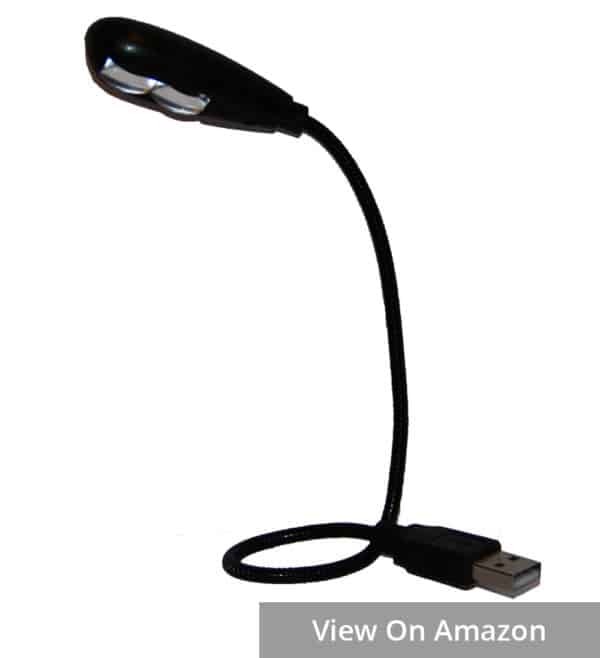 As the name suggests, this is a mini light that can be connected to your laptop or PC via a USB port. The whole item weighs only 1.0 oz or 28g, thus its head can stay stable on a small flexible gooseneck arm without any other support. Despite the tiny size, the i2 Gear has 2 LEDs with 2 levels of brightness, which can be set via a switch on its head. As it is very small, the light focuses on a small area. At the brighter level, it is just enough for me to see my laptop keyboard and a post-it note next to it. 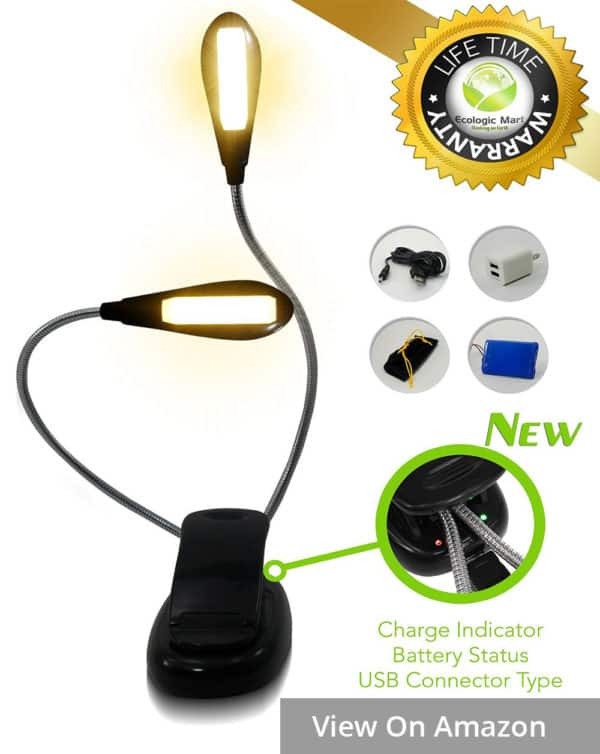 Made to be handy, the light comes with no battery, but it can work when connected to your power bank or any other normal charger with a USB cord. At its size and weight, the gadget is extremely portable. To be honest, however, other than illuminating my book and keyboard, I can’t think of many circumstances when it would be more useful than a lamp or a flashlight. 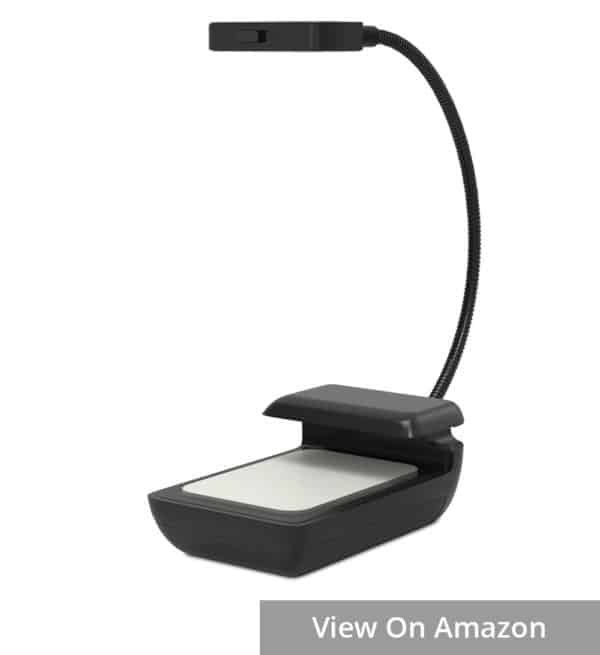 Below we have listed several criteria which a buyer should consider when choosing a booklight. This is the most important requirement for the best reading light. Some lights are too bright or uneven, some are too harsh or too dim or flickering, all of which are not good for your eyes. A good booklight should illuminate evenly on an open book. There should be different brightness settings that allow you to adjust the brightness mode to obtain the desired level for different reading environments. Stray light might awaken your bedmate or other travelers, thereby leading to interpersonal strife. That will not be tolerated. The light should shine on the page and nowhere else. The Clip must be big enough to attach to your book (or music stands) but soft enough to not rip the pages. It should adjust to the pages nicely also. The neck of the book-light should be adjustable and stays where it is put, so as to position the light exactly where you want it and keep it there. When choosing a reading light, pay attention to how long it lasts on a single charge, and whether a battery replacement will be necessary. Remember that if you don’t have good battery life you don’t have a good light. This depends on the quality of the book-light, quality of the battery as well as the brightness setting in use. 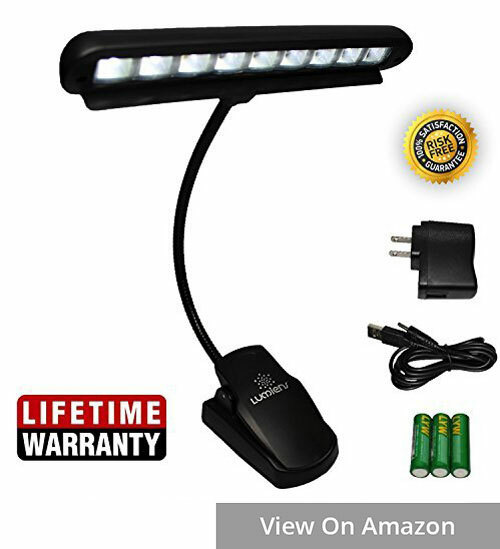 If you hate having to buy new batteries every time yours dies out, a rechargeable book light will be the best choice for you. It’s much more convenient. Besides, having a rechargeable one helps you save your money on the battery cost too. It is important, however, to follow the instructions from the manufacturer on charging the battery to keep its lifetime as long as possible. Notwithstanding advertisements from the distributor or manufacturer, it’s hard to feel completely secure about the product’s lifetime. 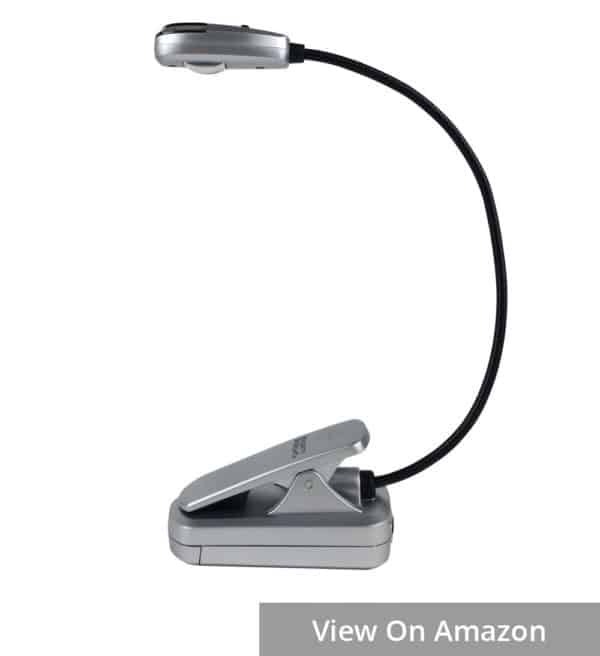 Your booklight may stop working at any time due to the breakdown in any part of it. A long warranty period will always be helpful, with which you may be offered a refund or a free-of-charge replacement in the granted period of time. This is a great breakdown of lights. I have a miners light that goes on my head. I look ridiculous but it works if I really want to finish something that isn’t on my kindle. I remember reading under the covers with a flashlight as a child. LOL Gotta love the advancements we have made. Thanks! Glad you found them helpful. AH Impressive Post, Thanks for sharing..!! Your number one pick has tons of complaints about a short life span. LuminoLite Extra-Bright. How did you decide it was the best? People are calling it disposable because it lasts 2 weeks to 6 months and then dies. The light secures its place in our top picks because of its various excellent features, as mentioned in the article. Some users may not be happy with it, which we are aware, but that is compromised by the excellent customer service offered, as you can also see in the critical comments. No products can satisfy everyone, but we strive to find the best for our readers. 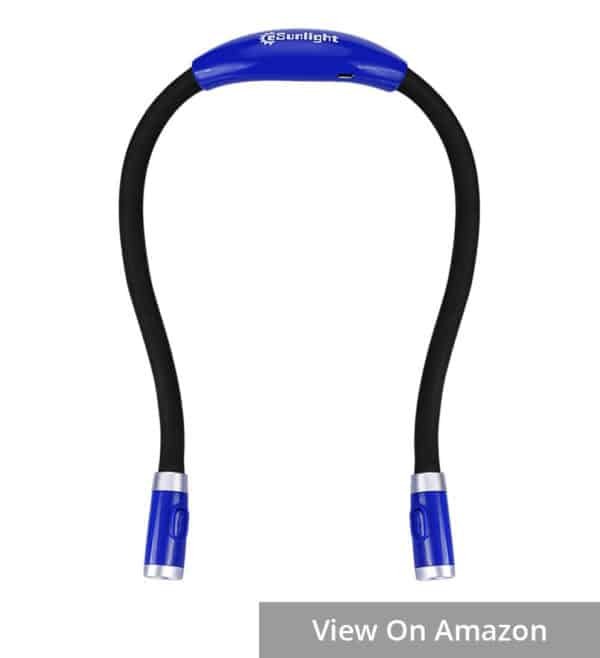 I bought Energizer LED and found good reviews about it. Regarding #5, there are rechargeable AAA batteries available. I can’t believe there’s not a book light with timer for less than $94. I know I bought one for my granddaughter several years ago that had a timer and I KNOW I didn’t pay nearly that much. Any suggestions other than the Mighty Bright for $94?? The timer feature is crucial as she’s a bedtime reader and always falls asleep with her book light on. Same question. And why no USB charging with the Mighty Bright Timer light?! I guess they really believe that you can’t have it all. One criteria not mentioned that most important to me is how easily the light is turned on when jostled in a bag. That’s my biggest problem with my current book light. It’s a sensitive button that turns on which causes the battery to die out before I notice. I want to know which lights have switches and which have buttons. Still, a pretty cool list! I love how unique some of these are! Good list of lamps. Prob the best list on the internet! Big fan of the Lumiy reading lights. They’re compact, bright, and very high quality. The best lamp I’ve ever bought. Ecologic’s light, with the two branches, is a genius design that looks like it might be perfect for a student who’s done a midnight migration from their desk to the comfort & warmth of their bed! I’m a writer & do massive amounts of research, working long into the night. If this light will allow me to train one branch on a book or manuscript (or my tablet set on low illumination), and the other branch on my note pad it’s definitely going to be my next purchase!! Thank you for making this “brilliantly” vetted list! – Improves the way to replace the battery (without tools). – Increases the duration of the charge by installing LED with better quality and a 1200mAh battery (the previous one was 1000mAh). I hope to be helpful. Kindle Unlimited vs Prime Reading: Which is Better?